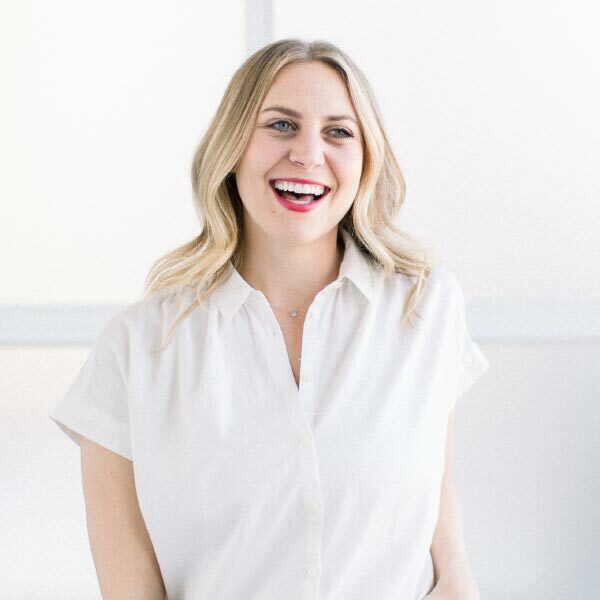 We’re talking all things Fit Foodie HQ today with our mid century home office room reveal! 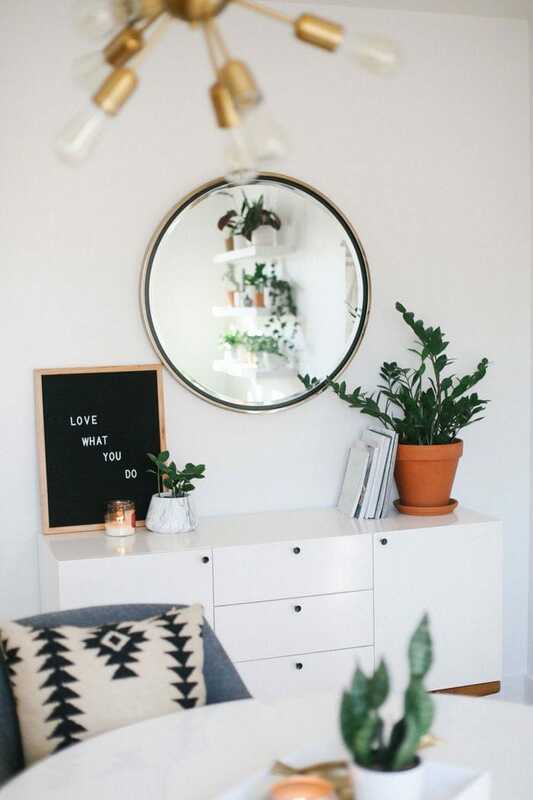 Check out our new multi-person workspace fully equipped with mid-century open shelving for our photography props, plants galore, lots of modern decor, and a wall tapestry! 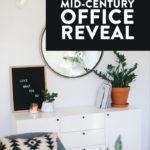 It’s our home office reveal day! I am horrible at keeping things a secret (mostly on Instagram), and because of that, I’ve pretty much shown you guys the entire process of the office! I say the entire process, but it’s actually not completely done yet. Windows are going to be installed in mid-December and phase 2 of the office is also coming in mid-December. However, I’m too excited no to share what we’ve got so far! Now that I look at the list I’m realizing we had to do a lot :P At the beginning it didn’t seem like a big undertaking but man, was it a struggle to get the ball rolling on this project. Mark and I immediately removed the baseboards and trim ourselves when we moved in and then it took a good 3 months to get someone reliable in our space to patch things up for us! Our home was built in 1939 and we decided that we wanted to replace baseboards and trim on the entire main floor along with new windows and lighting throughout. Our goal is to keep a lot of the character of our old house, but with new touches and finishes! 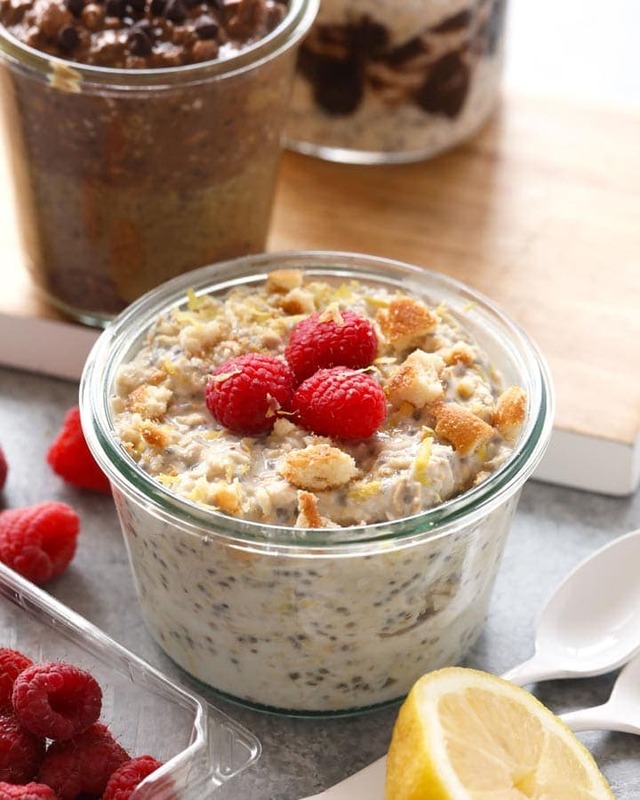 Step 1 in styling/remodeling the Fit Foodie home office was to create a mood board. I did lots of research on Pinterest and Instagram figuring out what kind of style I wanted to go for. I like to call the style of this room Mid-Century + White and Bright. I wanted to keep things airy and bright with lots of greenery. And, having a space for the team to work in that is not only inspiring but comfortable was also important to us. After general mood boarding, I moved into pinning product that I love for space (check out that board HERE). With that said, I wanted to give a BIG thank you to Overstock for sponsoring the majority of the product in this room. I was not compensated and all opinions are my own. Overstock was the perfect online retailer for everything in this room #Iloveonlineshopping. Never ever did I think I would get a roundtable for this space, but I am so glad that we did! I wanted to do something white and mid-century-esque that wasn’t too big or too small. 3 of us fit perfectly at this table and a 4th could get in there pretty comfortably as well. I love the wood legs and the black accents that this table provides. Chair-wise, we went the same mid-century style and my number one goal was to match the wood of the chair legs to the wood of the table legs. I love the ones we chose. They’re a simple light grey color with oak legs and they come in a set of 2! I am loving the rug situation in our office! We went with a rectangular rug to contrast the circular shape of the table. 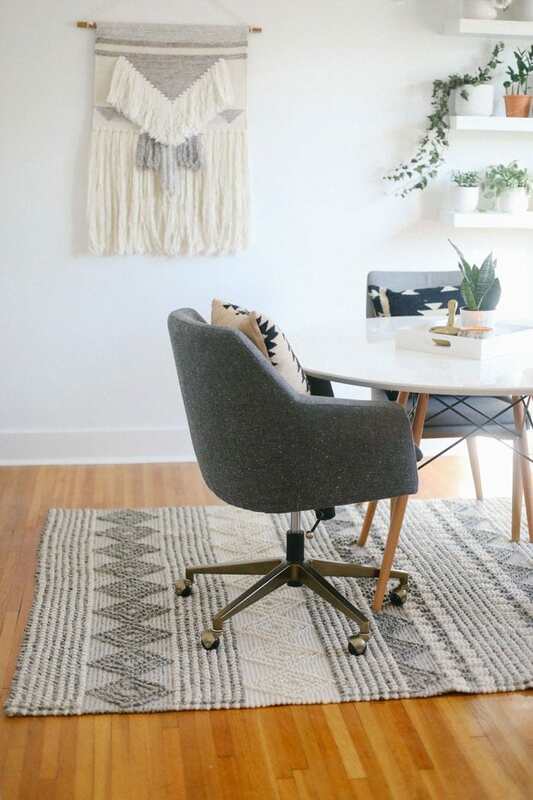 It’s a bohemian-style, handmade rug that is 5′ x 8′. It’s not too loud and is SO SOFT. 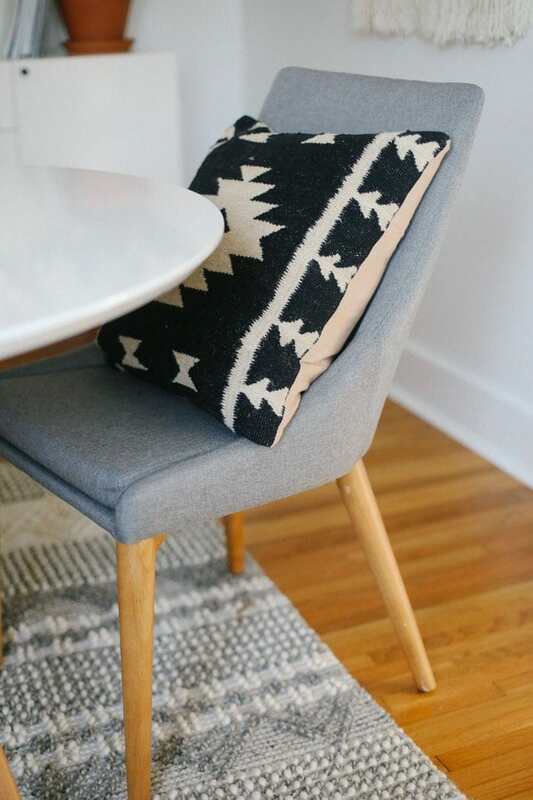 A good rule of thumb with rugs under tables: make sure that the rug is about a foot bigger on all ends of the table that is on top of it! 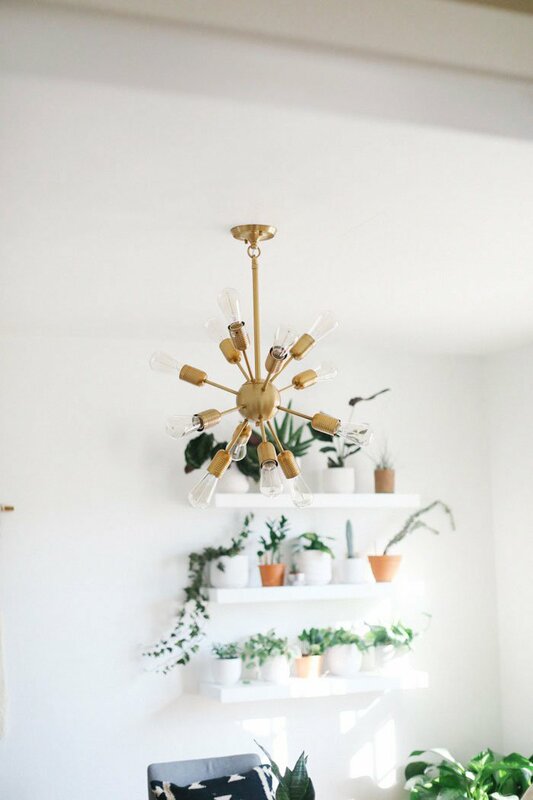 I knew that I wanted some kind of sputnik lighting above our table because I just love the dimension it adds to a room. 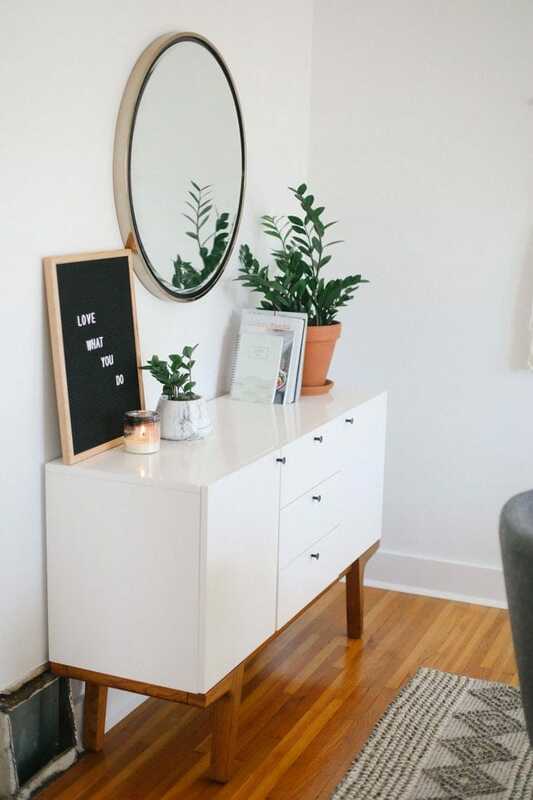 I thought about doing a flush-mount fixture for a hot second, but then I found one on Overstock that stole my heart. It’s a 17.5-inch gold fixture with Edison bulbs that actually has 2 different lengths from the ceiling. Since our office is pretty quaint without super high ceilings, we ended up removing half of the piping that went up to the ceiling, which made it fit perfectly in our space. I love having a buffet in the office because it provides so much additional storage for #alltherandomthings. We keep lots of administrative things in here along with all of our styling fabrics and a printer! 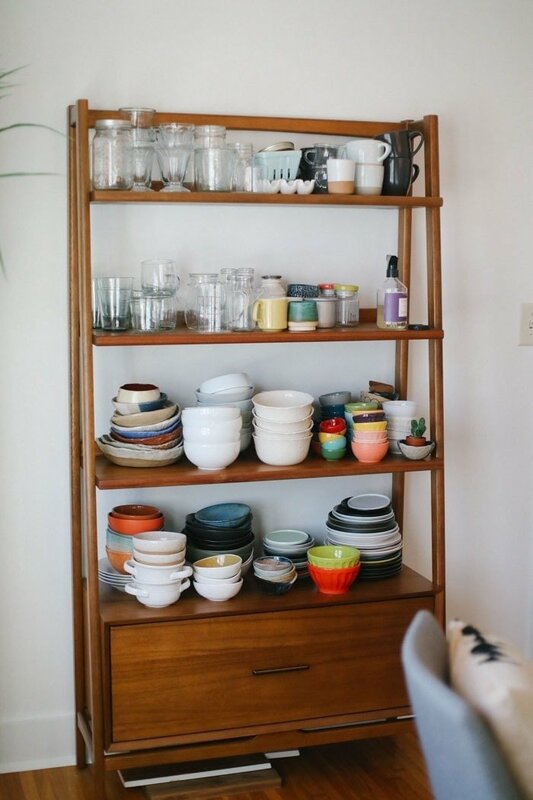 A shelving unit for all of our photography props was a MUST HAVE. For almost 8 whole years, I hid all of our photography props away and 1. it wasn’t organized 2. I never knew what I had and 3. I couldn’t even find what I needed! Now that we have an exposed shelving unit, I can find what I need and easily get inspired with the props we already own. 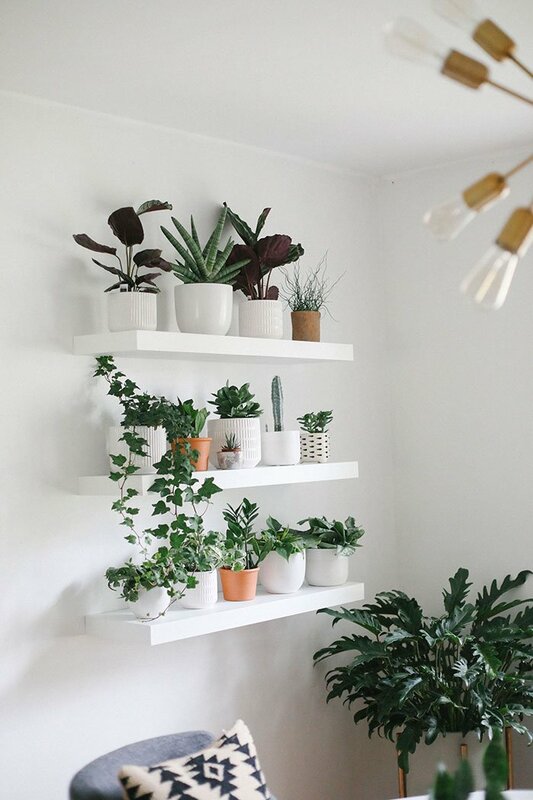 A floating shelf plant wall might have been the best decision I ever made for this office! We love plants so much and creating this wall has not only added so much dimension and greenery, but has made our space look so much bigger! We bought 3, 36-inch white shelves and I would highly recommend these to anyone looking to add floating shelves to any space. They are easy to install, sturdy, and high quality! The plant wall is made up of a variety of small pots that we got from both Overstock and a local plant store in Minneapolis called Tonkadale. You can check all of out here starting from the top left to the bottom right: Pot 1, Pot 2, Pot 3, Pot 4 (from Tonkadale), Pot 5, Pot 6 (from Tonkadale), Pot 7, Pot 8, Pot 9, Pot 10, Pot 11, Pot 12 (from Tonkadale), Pot 13, Pot 14. In addition to the plant wall pots, we’ve got a variety of different small pots scattered around the room to add additional greenery. THIS marble flour pot which lives on the buffet is my favorite. And THIS white and grey planter that has such great texture and usually lives on our table. 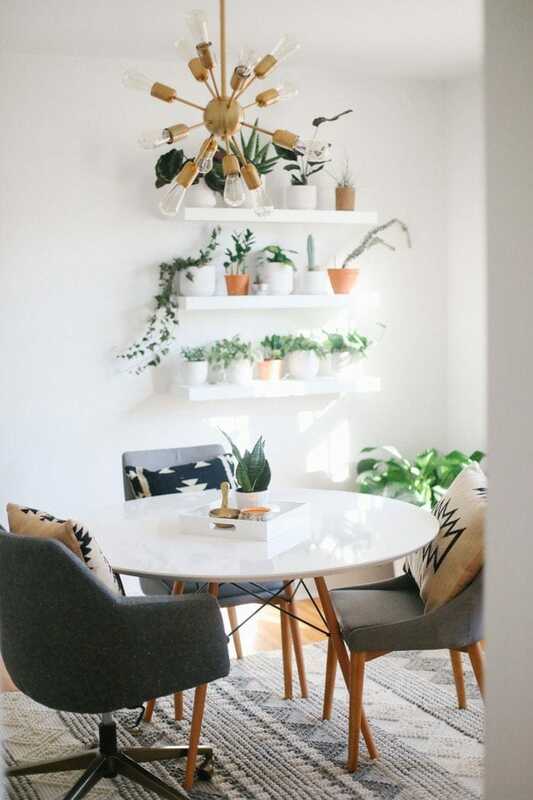 I know there are a lot of plants happening on the plant wall, but we knew we wanted at least one large indoor plant to complete the look of the room as well as 1 or 2 hanging plants near the window. The more plants the merrier and that’s a fact! 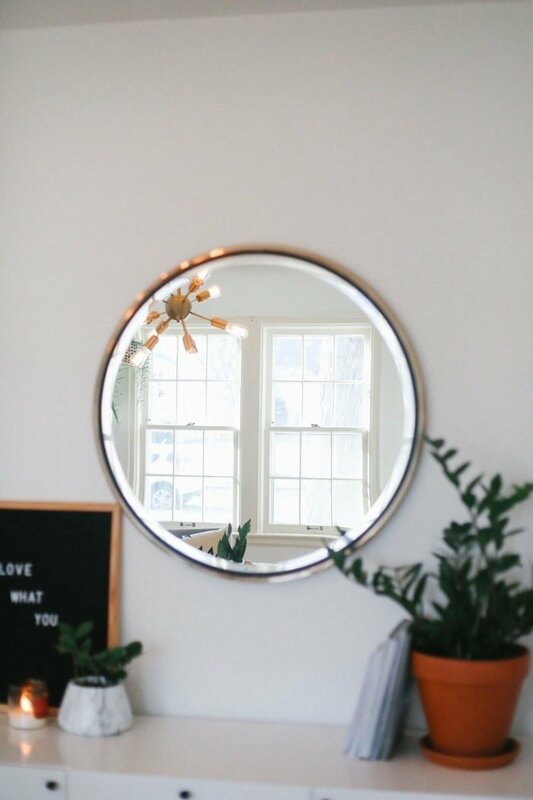 A circle mirror above our buffet storage unit was a no-brainer. I LOVE the one we chose from Overstock. It has gold and black accents, which really pulls in other features of the room and is the perfect size (30-inch diameter) for the space. I truly believe that every single office should have a letterboard. The one we got from Overstock is the perfect size: 16 x 20-in and come with the letters and numbers. 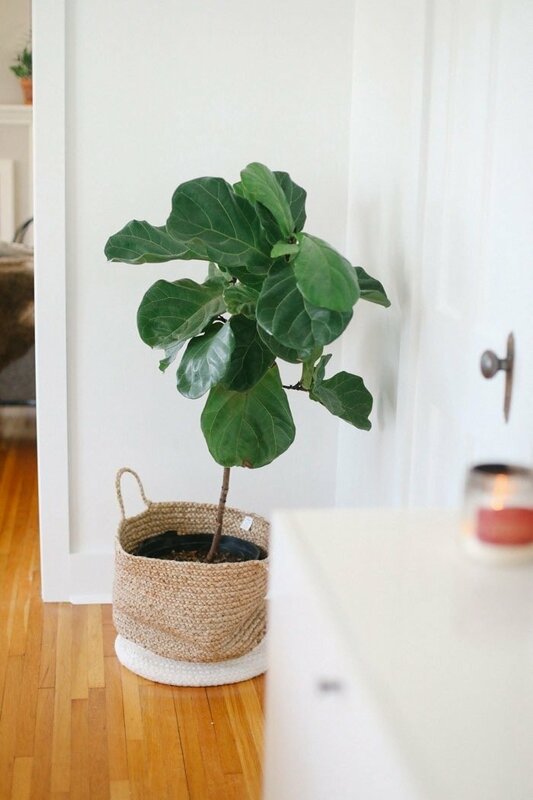 Woven storage baskets are such a great touch to have in the office for more storage and/or as a planter! The one we got is super affordable and the natural color of the basket really adds to the overall look and feel of the room. 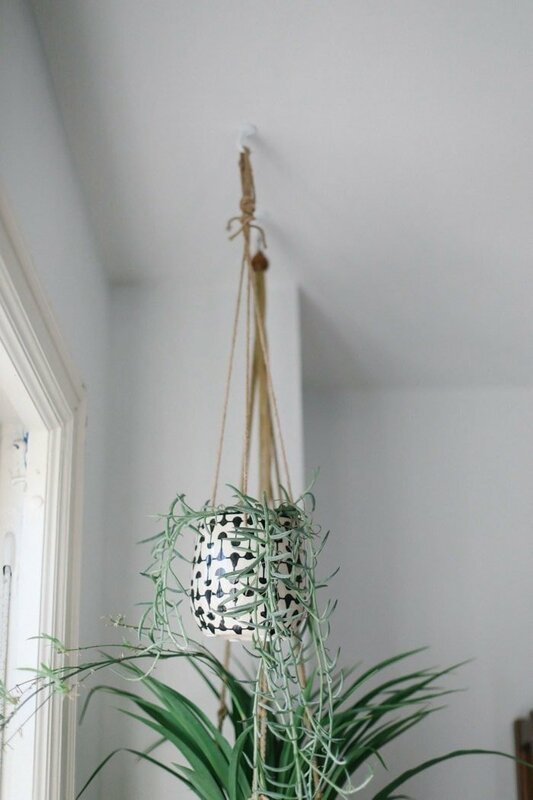 I am a macrame girl, so saving a space for some kind of macrame wall hanging was a no-brainer! Instead of doing something small, I wanted to make the space look bigger with one large piece to the left of the plant wall. That’s where this monotone wall tapestry comes in! I love it so much and the colors fit perfectly with the theme of the space. 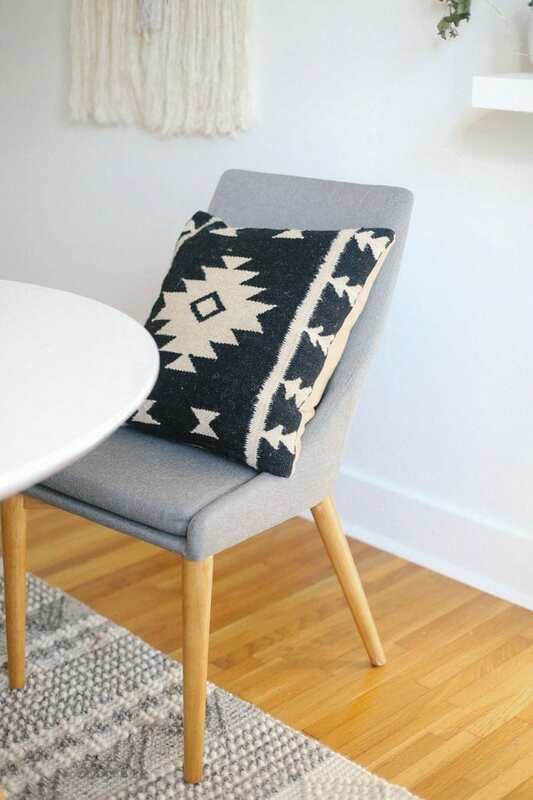 Aztec wool-blend pillows are a final touch on the table and chairs. Everything in the room is so bright and white that I loved these natural-colored pillows and a little aztec twist they give to the room. Wall Decor Still to Come! Once the new windows are installed and the barn door arrives, we’ll be able to finish hanging the rest of our wall decor. Stay tuned! For now, here’s a sneak peek of the cutest cactus paintings we’ll be hanging. Disclaimer: Overstock gifted us product for this post. I was not compensated and all opinions are my own.